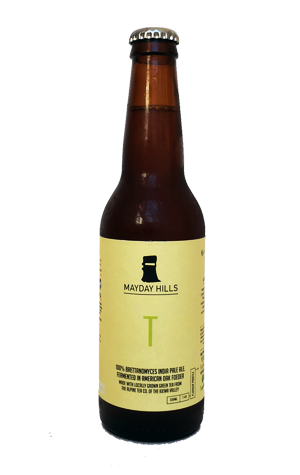 It's a case of T for two as Bridge Road Brewers release the second beer in the Mayday Hills range. For those that missed the launch last year, these are beers that are being brewed in the Beechworth brewer's new foeder, which you can read about here. They will all be fermented with nothing but Brettanomyces yeast; the first release was the fruity and fulsome Yee Hah! pale ale and here T is an IPA that features the addition of green tea from High Country neighbours, The Alpine Tea Co. Given it's boozier than its predecessor, is the second beer through the oak and has had green tea added to mix, it's a more complex and challenging affair. As it warms, you'll pick up anything from oaked Chardonnay qualities to creamy sweetness, pineapple and red berries on the nose, while on the flavour front it delivers bitter orange, boozy fruitcake and floral hops and tea as well as some Belgian-esque peppery spices. The tea adds a tannic element to the bitterness, making for a dry finish too.